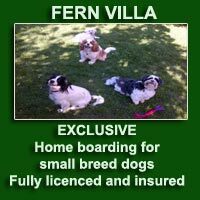 Fern Villa is an EXCLUSIVE home boarding service for SMALL breed dogs. Strictly no kennels! We provide much love and special individual attention just like any dog deserves. We are fully licensed by Rotherham Metropolitan Borough Council, we only home board a small number of dogs at anyone time. If you�re an owner of a small breed dog, rest assured, for the safety and comfort of all staying guests we unlike many other boarding establishments only cater for the niche market exclusively for small breed dogs. We have a small dog ourselves. All staying guests are vetted beforehand to ensure they are socialized, friendly and good mixers and enjoy the company of other little dogs. We are situated in Broom, Rotherham, South Yorkshire.